Players who feel that they have reached a certain technical level in the game often give a little snort when the thorny issue of practice is raised. All their practice, they will tell you, is taken care of during actual match situations when the effectiveness of an individual shot will tell them all they need to know about how well their skills are honed. To some extent, they do have a point: practice sessions by their very nature mean that movement and shots are executed with the pressure “off”; therefore, performance will not give a great indication of how a similar situation would play out when the tension of match-play fills the air on court and tenses up the racket arm. Nevertheless, it is worth buying into a few routines, if only to use as pre-warm ups before the big event. Firstly, think about your court movement. How well are you covering the playing area; how effective is your footwork? Why not find out by going through a mental and physical drill without the aid of a racket. 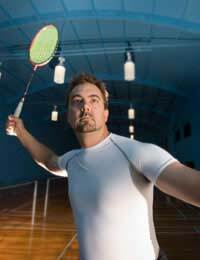 Simply warm up, then step on court and play a game in your head, for example letting your imaginary opponent tease you to the net, then have you back peddling feverishly for a smash or clear. Aim to cover strokes in the rear-, mid- and forecourt as well as service scenarios so that you give yourself a thorough workout. The fact that your strokes are all imaginary should not take away from the efficiency of the drill in gaining some knowledge of how well you are moving. Supplement this session, or make time for an additional one where you can take your racket and hit some shuttles to hone both your touch and your eye. For example, place a shuttle tube on the intersection of the opposing long singles service line and centre line, and see how accurate you are in hitting it from: the short service line, the midcourt sideline and the long doubles service line. Practice with both the forehand and backhand, and mix up the trajectory of individual shots. Take note not just of your accuracy in terms of the shuttle tube but whether you are tending too hit long or short. In terms of practising with a racket and a partner, devote at least 15 minutes to each of those aforementioned zones: rearcourt, midcourt, forecourt and service. It may well be that both of you have strengths and weaknesses in different areas, which means you can each help the other. Analyse your racket skills as well as your movement, and try to pinpoint where those areas of weakness lie. Once you have identified these, be brave enough to address them and repeat particular shots or scenarios until you feel you are getting to grips with the problem. The input of a coach may well speed up your ability to overcome the problem. The evolution of a badminton player is constant. Well, at least it should be. Rest assured that the know-alls will quickly find their game regressing as it suffers under the weight of their own arrogance. Making time for practice, on the other hand, means more court time, which in turn means both your hands and feet will be sharper when it comes to matchplay. Not only will this mean you have a greater chance of winning, but your greater efficiency on court will make the experience a great deal more enjoyable.